Sample job application for the post of primary school teacher and primary grade teacher of any grade in primary school available for download. This application to apply for primary teacher describes relevant field experience in school and explain your interest and motivation for the school job. It is stated that I have working experience of three years in teaching field. I have good method of teaching and good skills to communicate too. I am bachelor degree holder but now I am looking for a job as a primary school teacher in your school. I have attached my experience letter with application form too. So sir have a kind look on my documents and grant me a job as a teacher in your school. Through an advertisement in the NY Times news paper, on the date February, I have come to know about the vacant position of primary school teacher at NY Grammar school. I am masters in MSBM and I have been teaching at Lords International school for 3 years. I believe that I have considerable qualification, experience as well as required skills for this post. My experience will help me for development and motivation of young minds. I have enclosed the relevant documentation along with my CV to support my application. I am looking forward to have a discussion with you regarding the opportunity. With reference to your advertisement for vacant positions in daily newspaper I am sending my resume for Primary School Teacher in your prestigious school. Along with my qualification in Education I also hold one year teaching experience in a reputed international school. Teaching is my passion and I love to teach the kids at the beginning stage of their education. I am talented and have excellent communication and teaching skills for such little minds. My resume is attached for your review which will explain my education and teaching experience in details. It is stated that I am writing this application to apply for the post of the primary grade teacher which you have just opened. Sir, I want to say that I have done my Masters in Education from XYZ University. I have cleared my masters in first division. Along with that I have an excellent grip on English communication skills. I have a certificate of Workshop held on English Grammar from ABC institute. Previously I have worked for PQR group of schools as an English teacher. I can prove to be a valuable asset for your institution if you will kindly allow me to work and perform my services here, in your institution. I can assure you that there would be no issues regarding discipline, punctuality or any other disputes. I believe in utilizing my teaching skills in a positive way in order to benefit my students and create a productive and cooperative environment in my surroundings. I hope that you’ll take in view my application for the post of the primary grade teacher. I will anxiously wait for the interview call. I will be really obliged if you will allow me to serve in your institution. Thanking you in advance. 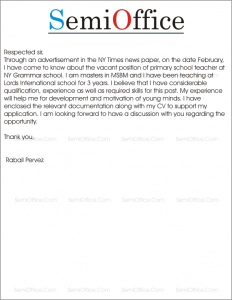 Respectfully, it is stated that I have seen your ad on daily e-paper which shows that there is a vacant post in your school for junior teacher. I think I am a great match for this post and therefore I am applying for this post. My complete bio data is given as under. Previous Experience: 2 years for Montessori Kids in Stars Junior School. Please allow me to meet you once for interview. I hope I will prove myself as a better Choice. 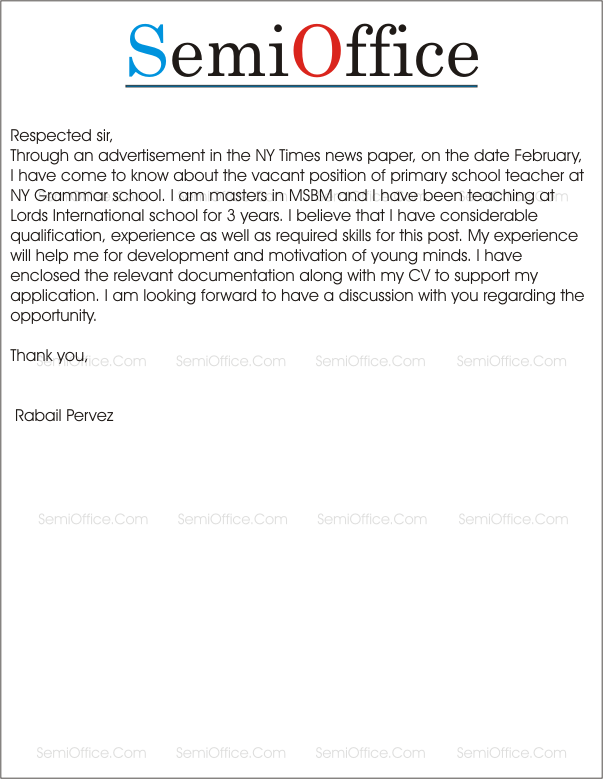 Sample application for job in school for teaching or as internee at any school. Simply change the name and make this application yours. Application for teaching used to apply for jobs in schools, colleges, universities and academies by teachers, lecturers and professors. My name is Mariam. I am a nineteen years old who recently completed her school education and is looking for an internship or Job. I graduated from Leeds Grammar School, in august 20XX and since then, there been taking a year off studies to experience different environments before starting college in the fall of 20XX. The cause this school’s work is very close to my heart so I am deeply interested in offering my services to The Lords International in whichever way possible. I hope I can be considered for an opportunities to work here.